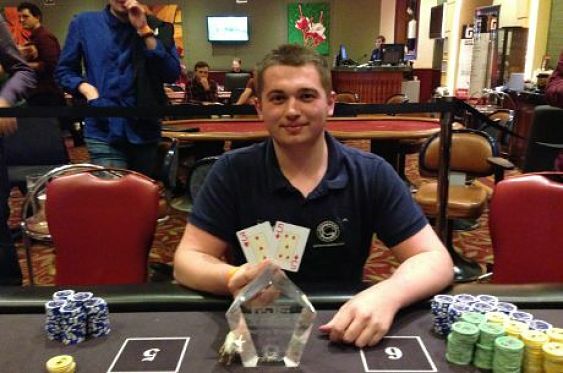 “The main piece of advice I’d give is to stay patient” - these are the words of University of Plymouth student Mike Dorman, and newcomers to the Grosvenor UK Student Poker Championships could do a lot worse to listen to him? Why? Well, Mike took down last year’s Main Event for £2,500 and a seat in the GUKPT Main Event of his choice (he opted for Reading, but sadly didn’t cash). Unfortunately, Mike will not be returning to Grosvenor Casino Coventry this year to defend his title - he’ll be enjoying a skiing festival in Austria instead, after booking the holiday months ago - but the marine sports technology student plans to return in 2016 to reclaim the honour of the best student poker player in the UK. Last year’s victory came at the second time of asking, and represented the largest live tournament Mike had played at the time. “Most of the people haven’t played in a three-day tournament before,” he told Bluff Europe. “It’s important to know when to be more aggressive and when to sit back - I saw people getting into unnecessarily huge pots on Day 1, and that’s probably something I was guilty of the first time I played the UKSPC. Not all rookies had such trouble, however, and Mike was stunned to see fellow Plymouth student Matthew Davenport - someone he’d introduced to poker less than a year before - join him at the final table. In Mike’s case it was a slow but steady approach that helped him avoid any major missteps en route to the final table and eventual victory. “On the first day I didn’t have many standout hands. I played pretty tight and it was not until Day 2 when I started to pick up more hands and was able to play looser,” he explained. Mike is now Vice Chairman of his university’s poker club, and while he won’t be back at the Ricoh Arena this year he expects a 20-strong team of current and former students to make the trip up from Devon. He’ll also be back in Coventry over the summer - last year’s success gave him a real taste for live poker and he will be looking to go deep in the Goliath after cashing in last year’s record-breaking event. He also intends to play some 25/25 Series events after graduating - providing he gets a job that allows for it - and has already played during breaks from studying at the Grosvenor Casinos in Luton and Reading, among others. But for now it’s time to look ahead to this year’s UKSPC, which begins on April 8th at Grosvenor Casino Coventry, and is highlighted by the £30+5 re-entry Main Event. Who will come out on top this time around?